Need to send a package to Kazakhstan or a set of china to Great Britain? Postal Connections has done that and lots more. The store at 5707 Red Arrow Highway offers a wide range of services, including printing, internet services, renting mailboxes, photocopying, key making, selling packaging supplies and shipping. Diane Eaton took an indirect route to owning the business, which she bought in 2010 from Joe Killian. 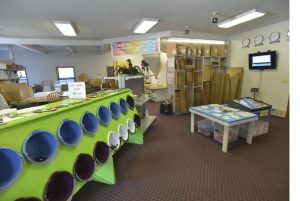 Killian opened the franchise in 2007 in the strip mall by Martin’s Super Market at John Beers and Cleveland Avenue. When Martin’s tore down the mall in order to build a new supermarket on site, Killian moved Postal Connections to its current location in 2009 – in the retail complex at the southeast corner of John Beers Road. Eaton said she was a registered nurse at the former Memorial Hospital in St. Joseph in the 1970s, then worked for Health Care at Home, until 1996. She then helped her husband, Tony, with his business selling tool and die making equipment. But then an accident put Tony in a wheelchair and forced him to close his business. As a result, Diane was home with him for several years.The Eatons knew Killian and had helped him at Postal Connections. Killian also operates Light on the Hill Business Services, which he wanted to focus on. 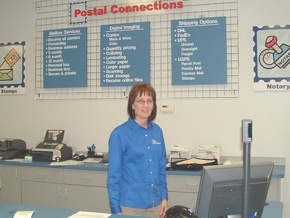 She spent time at the store working with Killian, and after the purchase, he helped her.Killian was the lone worker at Postal Connections and when Eaton took it over, she was alone.But she now has two employees, Dave Plumhoff, who works full-time, and Sherry Wright, who is part-time. In addition, Tony Eaton works from home doing the paperwork for Postal Connections. The store is open weekdays from 9 a.m. to 6 p.m., and Eaton said she’s usually there the whole time, while Wright staffs it on Saturday, when it’s open from 9 to noon. One unique service the store offers is building wood crates to ship items too big or too heavy for corrugated cardboard boxes, and arranging the shipping. Furniture is a common item to go in the wood crates, but there’s also been an exercise machine, a removable car hardtop and a set of china that went to Great Britain. “We heard back, and (the dishes) arrived just fine,” Eaton said. Postal Connections ships most packages by UPS and FedEx, but for international shipments, DHL is used most often. There was the package to Kazakhstan, a country that borders Russia on the south. More frequent, Eaton said, have been shipments to several countries in Africa, plus India, Saudi Arabia, Great Britain, France, Switzerland, Australia, Canada and Mexico. Businesses and residential customers can have packages delivered to Postal Connections for pickup. An employee signs for the package and then the customer is notified to come get it. 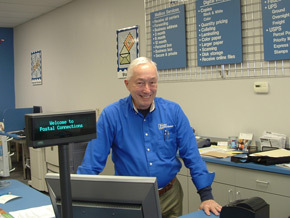 Postal Connections is a franchise, with the parent company based in Frisco, Texas. Despite typically working 50 hours a week, Eaton said, “This is kind of fun. You meet a lot of people … you work with great people.” At 62, she said she’s looking ahead to retirement, but not soon. One Half mile west of downtown Stevensville. On the south east corner of John Beers Rd. and Red Arrow Hwy. Service to home and small growing businesses is a hallmark for us. Complete packaging and crating services with secure track-able shipping via UPS, Fed-Ex, DHL. We also offer shipping via the USPS. Within our store we also offer Direct Mail to a specific customer profile within your area of service is the most effective means of getting the message to your client base. We can help! We will help with design, printing, mailing list and bulk rate permit. Postal Connections of Stevensville can help with “banker box” overload, by safe secure image scanning, storage of documents on media and total secure document destruction. Mailbox Rental with 24 hour availability can provide safe reliable means of obtaining all of your mail in a timely fashion, (no more missed packages to track down – are they on the truck or at the warehouse or somewhere in between!). 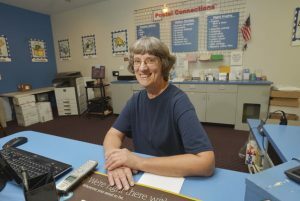 It is also a low cost way of providing a business address: (Example) Albert Einstein’s Critical Mass Capacitors, 5707 Red Arrow Hwy, # 201, Stevensville, MI 49127. Stevensville Postal Connections Book drive to support Veterans and troops. STEVENSVILLE —To honor Veterans Day, Stevensville’s Postal Connections has launched a drive to give paperback books to servicemen and women around the world, veterans in need and patients in VA hospitals.